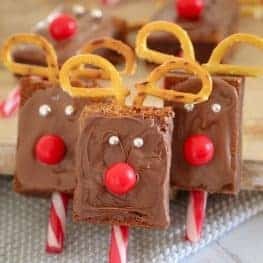 These cute-as-a-button and super easy Christmas Reindeer Brownies are sure to be a hit at class Christmas parties or end of year celebrations! 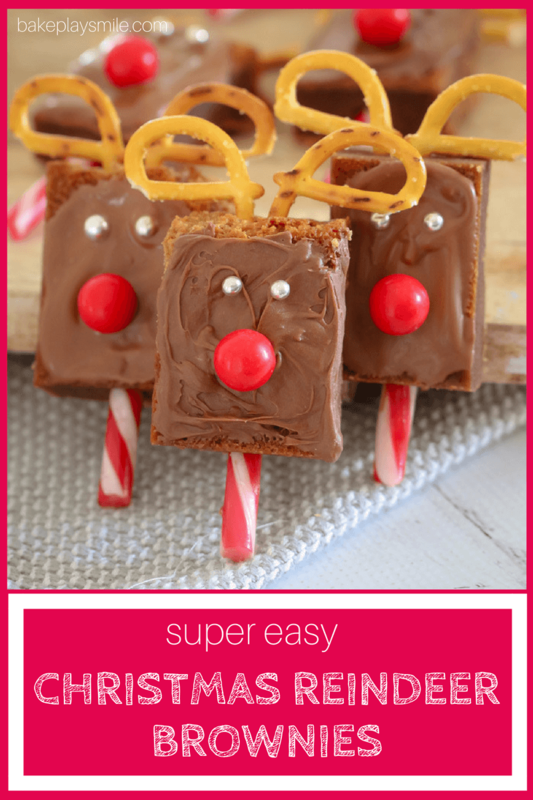 I am so excited about these easy Christmas Reindeer Brownies. They’re cute. They’re super simple to make. PLUS your kiddies are going to LOVE them!!! 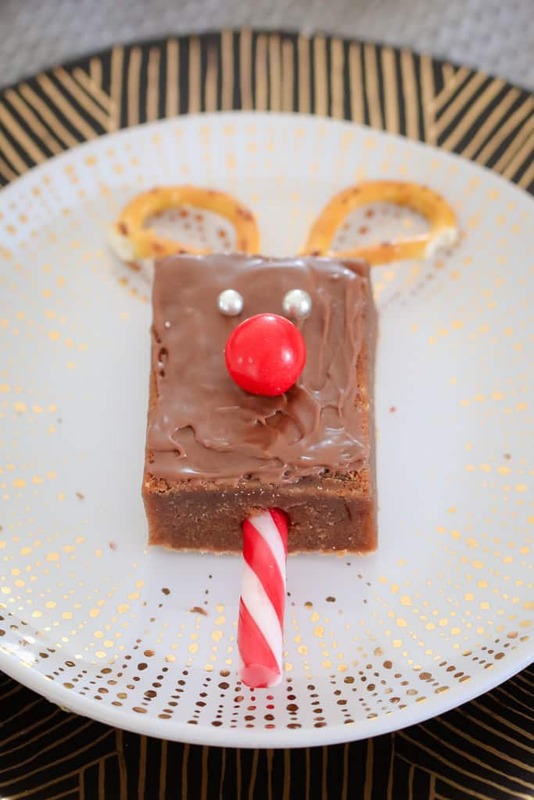 In fact they’d actually be the perfect thing for the kids to help decorate (unless you’re like me and have a toddler who may just eat all the ingredients as you go… and put the eyes where the nose should go… and the antlers on at the bottom… you get me, right!!?). First they’re made with the simplest brownie recipe (it takes 5 minutes to prepare and is AWESOME!). 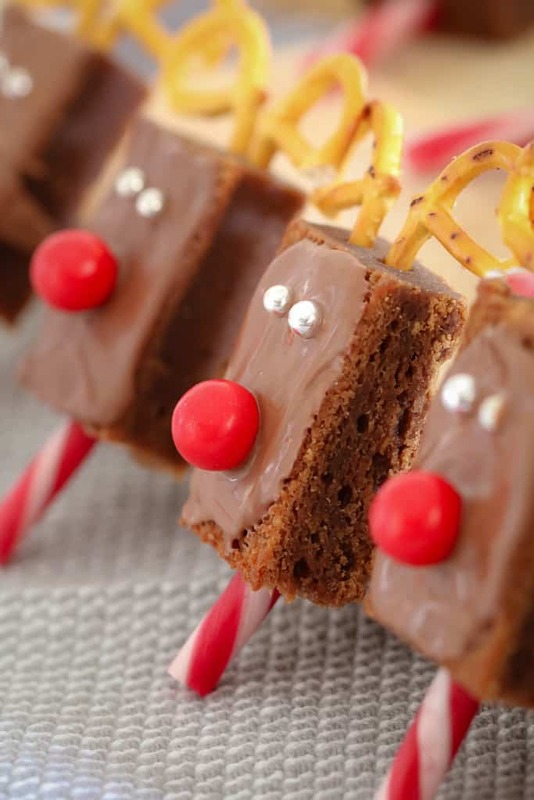 You need to use a nice, moist brownie recipe for these reindeers as you’re going to be sticking some of the decorations into it. Then it’s just a matter of decorating with pretzels, melted chocolate, Jaffas, candy canes and edible silver balls. Too simple, right!? 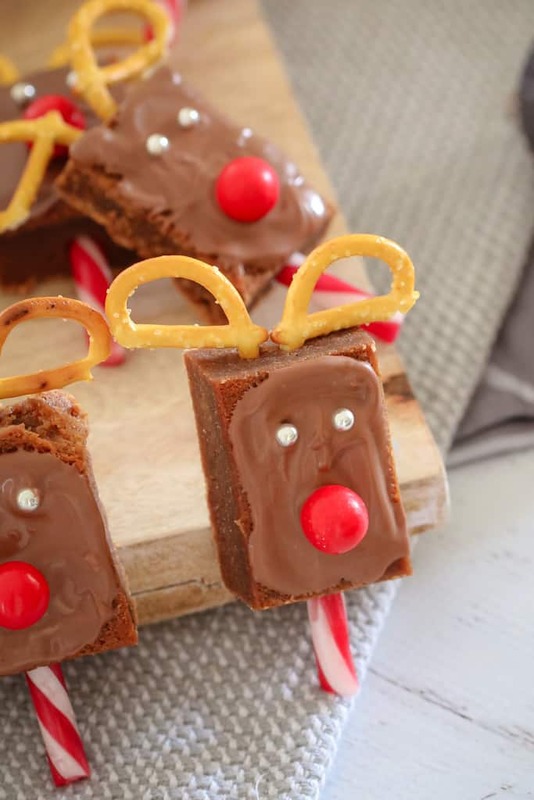 Yep, these super easy Christmas Reindeer Brownies are going to make your Christmas prep soooooo much easier (and yummier!!). 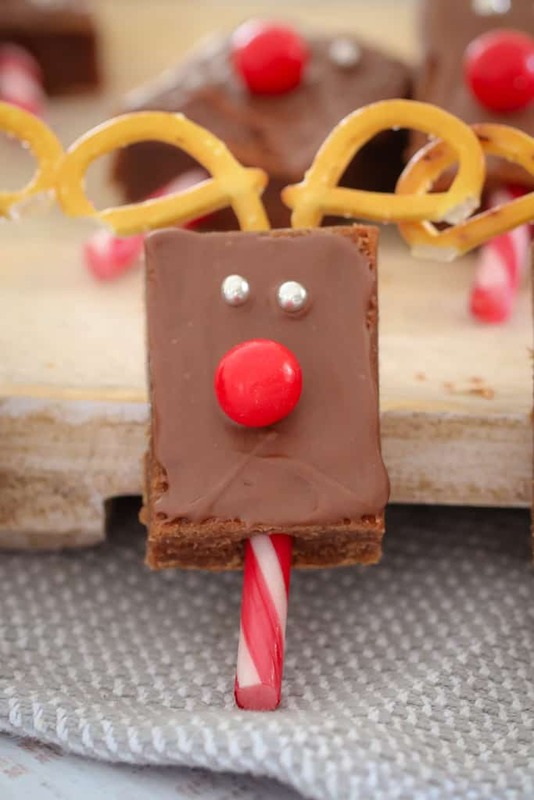 WATCH THE VIDEO: How to make super easy Christmas Reindeer Brownies.. 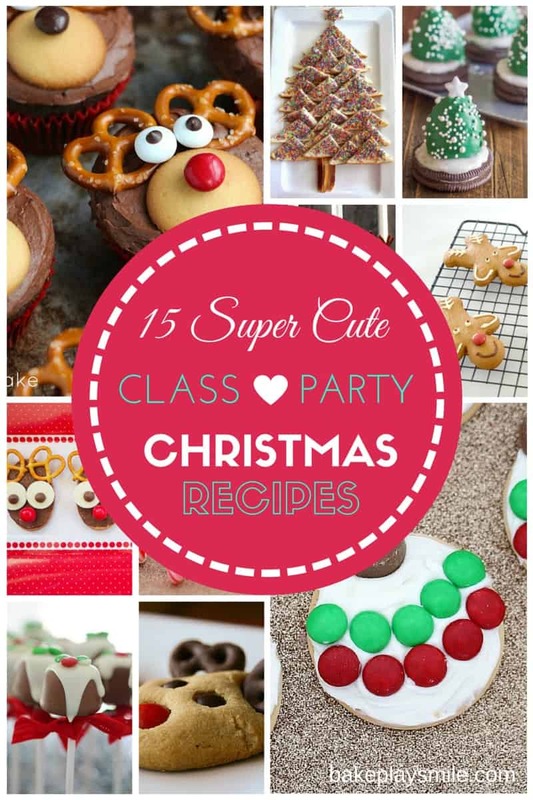 If you’re after some more class Christmas party recipes, then check out my full collection here. Love this recipe? 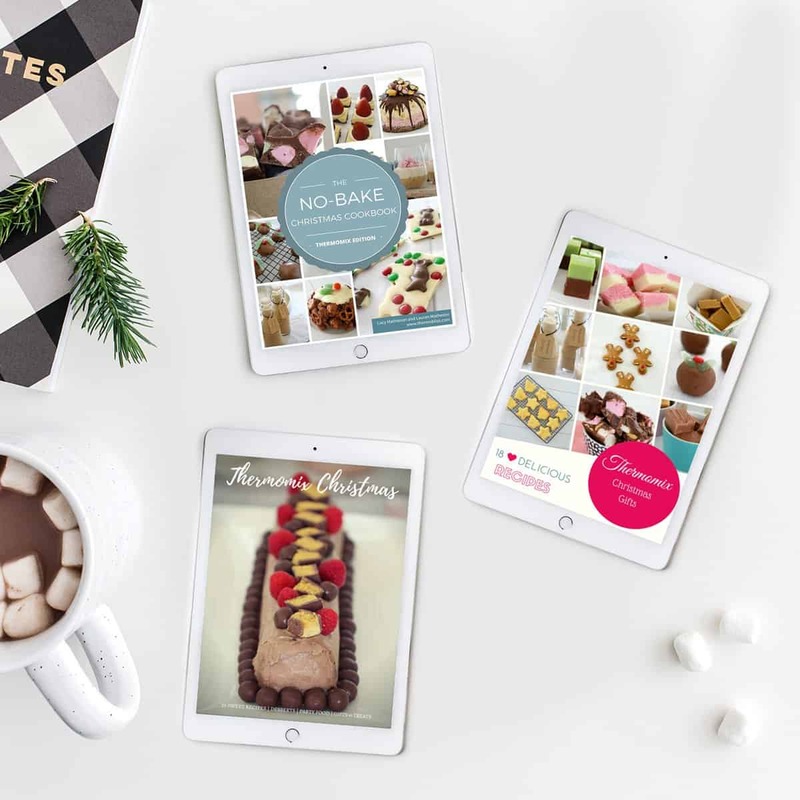 Check out our range of Christmas recipe eBooks (available in both Thermomix and conventional versions). These can be downloaded immediately, saved to your computer, tablet, iPad or phone. Or if you’d prefer a hardcopy, all of the eBooks can be printed to A4 size. 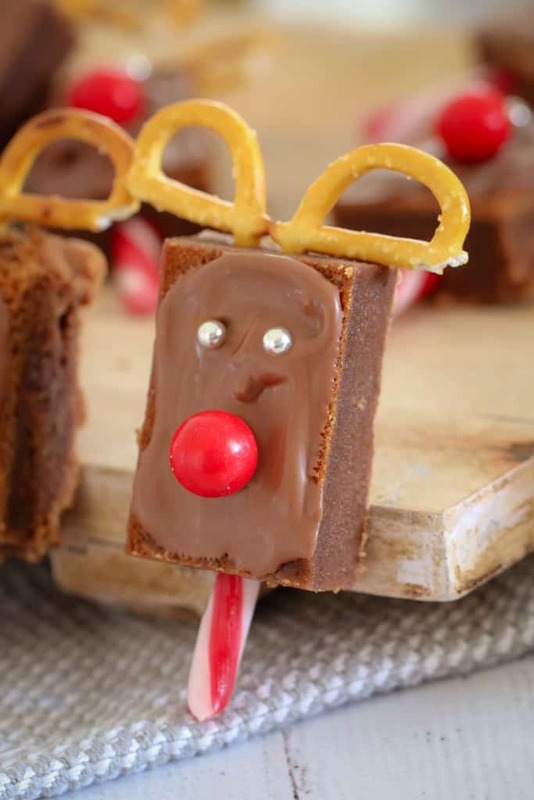 These cute-as-a-button and super easy Christmas Reindeer Brownies are sure to be a hit at your class Christmas party or end of year Christmas celebration! Add the caster sugar and cocoa powder and stir. Heat in the microwave on 30 second bursts (50% power) until melted and combined - stirring each time. Pour the brownie mixture into the prepared tin and bake for 30 minutes or until just cooked through (do not overcook). Leave in the tin to cool completely. Trim any raised edges off the brownie so you have a completely flat square brownie. Turn the brownie over onto a flat board. Cut the brownie into 16 equal rectangles. Cut the pretzels in half using a sharp knife. Press the pretzels into the top of the brownie pieces for 'antlers'. Spread melted milk chocolate over the front of the brownie pieces (do a couple at a time so that the chocolate doesn't set too quickly). Add a Jaffa for the nose and 2 silver cachous for the eyes. Trim the candy canes with a knife so that you have small straight pieces (approx 6 cm in length). 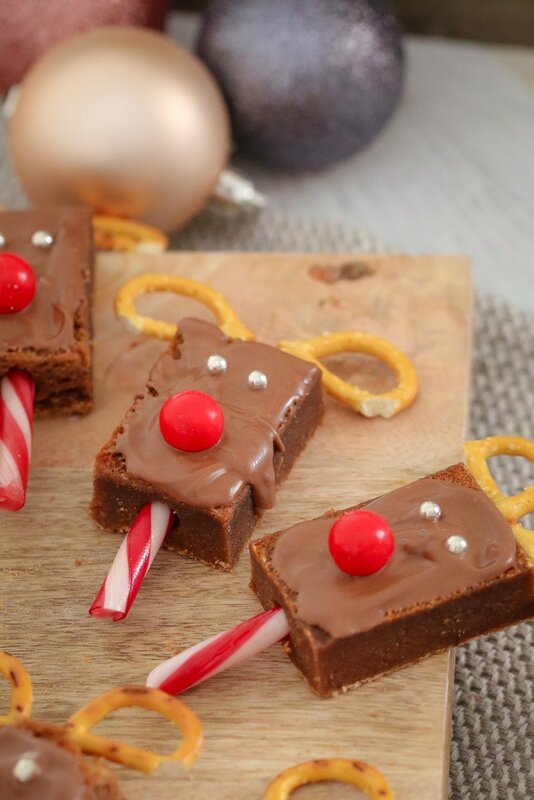 Insert the candy cane into the base of the brownie pieces. Please note that you will have some pretzels, Jaffas and silver cachous leftover after decorating (perfect for nibbling on as you go!!). You can buy silver cachous (small edible balls) in the baking section of most large supermarkets. If you can't find Jaffas, you can use any red coated chocolate balls (or even red M&Ms). The chocolate brownie can be prepared ahead of time and frozen in an airtight container until needed. Allow to come to room temperature before cutting and decorating. Place the butter into the Thermomix bowl. Melt on 80 degrees, Speed 2, 3 minutes. Add the caster sugar and cocoa powder and mix on Speed 4, 10 seconds. Scrape down the sides of the bowl and repeat for a further 10 seconds. Add the vanilla extract and the eggs and mix on Reverse, Speed 4, 10 seconds. Scrape down the sides and repeat. Add the plain flour and mix on Speed 4, 5 seconds. Scrape the sides of the bowl and repeat. Pour the brownie mixture into the prepared tin and bake for 30 minutes or until cooked through. These are so adorable! 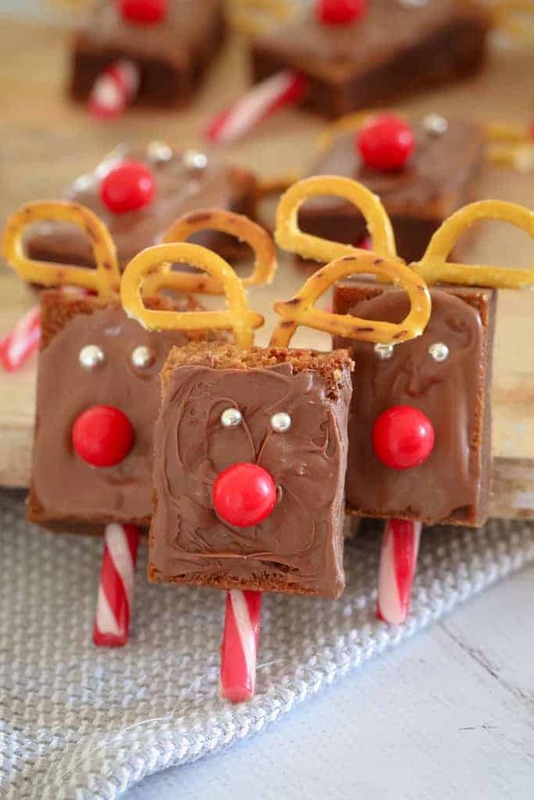 Something that will add that Christmas spirit to the desserts of our festive family dinner.